August 2017 marked the 20th anniversary of the tragic and premature death of Diana, Princess of Wales. Beautiful, elegant, charismatic and compassionate, Diana embodied all the qualities we admire most in a princess. Diana, Princess of Wales, captured the hearts of people worldwide with her unwavering warmth and compassion for the poor and needy. Beautiful, elegant, charismatic and kind, Diana embodied all the qualities we most cherish in a princess. She used her high profile to raise awareness for many charitable causes and worked tirelessly as a humanitarian ambassador. Diana's tragic death in 1997 was met with shock and grief worldwide – but her memory and legacy lives on as an inspiration to us all. 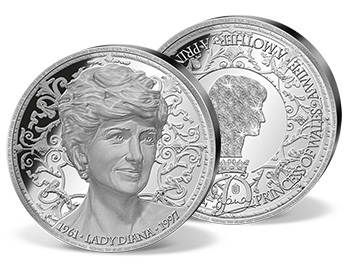 A special commemorative coin has been issued in remembrance of Diana, Princess of Wales, on the 20th anniversary of her death in August 1997. 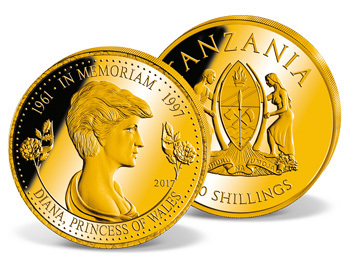 Minted in the highest quality 'Proof' and preciously gold-plated, this stunning 'Diana, Princess of Wales' 100 Shillings commemorative coin is strictly limited to only 25,000 pieces worldwide. Beautiful, elegant, charismatic and compassionate, Diana embodied all the qualities we most cherish in a princess. From the moment of her fairytale engagement, over 35 years ago, she captured the hearts of the nation as the 'People's Princess'. Diana was seldom away from the public gaze and was the focus of near-constant media scrutiny throughout her marriage and after her divorce. Her beauty and charisma meant she was one of the most photographed women in the world. However, Diana used her fame and high profile to raise awareness for many unfashionable but worthy causes, including AIDS, leprosy and the homeless. She became a much respected humanitarian ambassador and worked tirelessly on behalf of charities around the world. 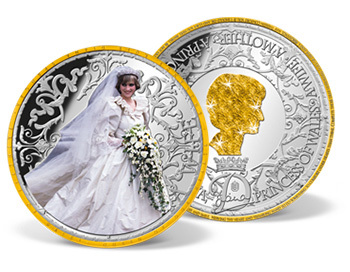 Minted in highest minting quality ‘Proof’ and preciously layered with 24-carat gold, this supersize commemorative strike is a beautiful tribute to England's Rose. A wife, a princess, a mother and a legend – Diana was a truly inspirational lady who touched the lives of so many people and will never be forgotten. Diana Frances Spencer was born on 1st July 1961, into an aristocratic family with royal ancestry. She was the youngest daughter of John Spencer, Viscount Althorp (son of the 7th Earl Spencer) and his first wife, Frances Roche (daughter of the 4th Baron Fermoy). Diana grew up in Park House, situated on the Sandringham Estate, in Norfolk. She had close ties with the Royal Family – as a child Diana would play with Prince Andrew and Prince Edward when they holidayed at Sandringham House. When Diana's father became the 8th Earl Spencer in 1975, she became Lady Diana Spencer, and the family moved to Althorp, near Northampton. Diana was tutored at home as a young child, then began her formal education at an all-girls boarding school, where she excelled at sport, especially swimming. After leaving school at 16, Diana attended the Institut Alpin Videmanette, a finishing school in Switzerland, but only stayed for one term. Upon returning to England, Diana began working as a nanny for an American family in London, then later worked as a Kindergarten assistant, at the Young England School, in Pimlico. Lady Diana first met Prince Charles, the heir apparent to the British throne, in 1977, when she was just 16, as he was initially dating her older sister, Lady Sarah. Prince Charles is said to have taken a serious interest in Diana as a potential bride in 1980, when they spent time together as guests at a country weekend and Diana watched him play polo. Their relationship progressed as Charles invited her for a sailing weekend to Cowes and to Balmoral Castle to meet his family. Then just six months later, on 6th February 1981, Prince Charles proposed to Diana and their engagement was officially announced on 24th February. On 29th July 1981, 'Lady Di' became the Princess of Wales when she married Prince Charles, at St Paul's Cathedral. An estimated 750 million people around the world watched the fairytale wedding live on TV. Diana was seldom away from the public gaze and captured the nation's hearts as England's Rose. Diana and Charles resided at Kensington Palace and Highgrove House. On 5th November 1981, the Princess's first pregnancy was officially announced, and on 21st June 1982, she gave birth to their first son, Prince William Arthur Philip Louis, second in line of the British throne. Their second son, Prince Henry Charles Albert David, known as Prince Harry, was born on 15th September 1984. Five years after the wedding, the marriage began to unravel as their marital problems became public knowledge. The couple separated in 1992 and their divorce was finalised on 28th August 1996. Diana was allowed to keep her title of Princess of Wales, but could no longer be addressed as Her Royal Highness. 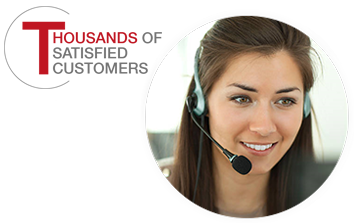 Despite the divorce, Diana sustained her charity activities and devoted herself to helping others. She expressed how "nothing brings me more happiness than trying to help the most vulnerable people in society." Diana is remembered fondly as the 'Queen of people's hearts' due to her unwavering warmth and compassion, as evident when she shook the hand of an AIDS patient at an English hospital in 1991. This act of kindness made a huge difference in public attitude to the disease. In 1992, Diana comforted a dying woman at Mother Theresa's hospice in Calcutta, India. The experience was deeply spiritual for Diana and shaped her firm commitment to help the less privileged. She went on to support over one hundred organisations, including the Royal Marsden Hospital, the Leprosy Mission and the National Aids Foundation. Diana used her high profile to raise awareness for many unfashionable but worthy causes. She became a humanitarian ambassador and was in great demand: her mission for the British Red Cross as part of an international network, supporting a campaign banning landmines, attracted worldwide publicity. Diana, Princess of Wales, was one of the most adored members of the British Royal Family and became one of the world's most beloved figures. Diana's tragic death at the age of 36, on 31st August 1997, in a car accident in Paris, was met with shock and grief worldwide. Her sudden death provoked an unprecedented outpouring of public mourning. Over 60 million flowers in a sea of bouquets were laid outside the gates of Kensington Palace. Diana's funeral was held at Westminster Abbey on 6th September 1997. The procession and ceremony was watched on television in 60 countries around the world. Although over twenty years have passed since her death, Diana is still greatly missed and will never be forgotten. With her beauty, grace, compassion and generosity, Diana captured not only the nation's hearts but the hearts of people all over the world. In 2016, Diana was unanimously voted the most iconic woman of all time. A wife, a princess, a mother and a legend – Diana was a truly inspirational lady who touched the lives of people wherever she went. 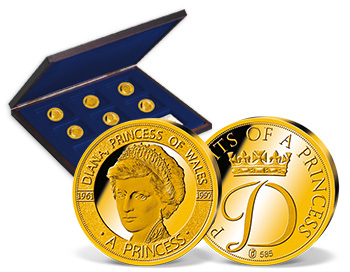 Many people are searching for special commemoratives in remembrance of Diana, Princess of Wales. 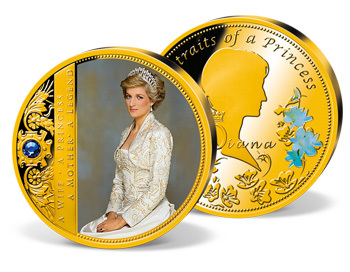 Windsor Mint is proud to offer a stunning selection of commemorative coins and strikes that capture Diana's exquisite beauty and provide a lasting reminder of England's Rose.